What if the mountains no longer existed ? In Italy, small school children would feel very lost. A study recently carried out in the Val d’Aoste revealed that often heartfelt sentiment. If, with a magic wand, the wonders of their daily life were swept away, the mountain children would be bereft. Thousands of babies have entered this world thanks to Adeline Favre. Born in 1907 in the Valais, she assisted birthing women for half a century, often under difficult conditions in the mountain villages where traditions weighed heavily on womenfolk. Her account is the subject of a book edited by Monographic (Sierre) under the authority of anthropologist Yvonne Preiswerk, whose excerpts here introduce the story told by Adeline. For apprentices of yore, learning a trade was not easy. The training of the future craftsmen was dispensed under the patriarchal discipline of a master. Between the effective, hands-on training and help with daily chores, no one counted the hours spent or the heads knocked. A means to transmit professional know-how (and general facts about life) that has continued for centuries, in the Dauphiné and elsewhere. The little chimneysweep is part of Alpine lore. But behind the popular image of the smiling boy, with his grimy black face and red bonnet, is a horror story worthy of Dickens. Torn from their poor families at a very young age, hundreds of these mountain children had to earn a living under terrible conditions. A village full of dolls, rocking horses, small soldiers and miniature farms. In the 1800s, the village of Ortisei in the Trentin Dolomites was the capital of wooden toys. Carved by the mountain families in the outlying hamlets, these handmade, family toys were long the joy of children throughout Europe. And a source of wonder for a travelling Englishwoman. Advantaged, the mountain children ? Not necessarily, according to anthropologists. The pleasures of pristine snow and clean air would not seem to compensate the closed schools, work in the fields and, above all, the obligations of catering to tourism. Compared to city children, those from the high-altitudes do not always have it easy. Lead children along the path to the summits and to virtue, through education. That was the life’s work of Heinrich Pestalozzi, a Swiss philosopher and teacher, during the troubled period at the end of the 1700s. With Europe just entering the industrial revolution, this follower of Rousseau promoted educational methods whose influence is still felt to this day. Switzerland, the war years. Emil Brunner photographed children in the Grison mountains. His strong work has now been revived by the Fondation suisse pour la photographie through an exhibition and a book. Both remarkable. Throughout his childhood, each summer, he went to camp at the Correrie de la Grande Chartreuse. Since then, Jean-Louis Roux has, of course, grown up. But, he never forgot those summers spent in the shadow of the Grand Som. In a story combining both humour and emotion, he attempts to gather up his memories, not without sustaining that part of mystery which is the very essence of childhood lost. A great whirl of children’s faces shine through the work of Swiss photographer and alpinist Dölf Reist. Comprising some 70 000 images, the collection was just donated to the Musée alpin suisse in Bern by the widow of the author, who died in the year 2000. An initial exhibition, intended as a playful journey for younger visitors as well, was devoted to the children living in mountains around the world. 1979, the year of the child. The Musée dauphinois, in Grenoble, was directed by Jean-Pierre Laurent, the renovator of what were later to be called « societal » museums and inventor of exhibition scenarios. For the occasion, he produced one of his most remarkable works, Mountain children. 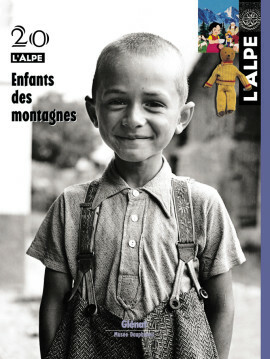 The title, used for this issue of L’Alpe, is in hommage to the man and his work. Famous even in the remote reaches of Japan, the little mountain girl represents the green paradise of childhood as well as the utopian innocence of the world. A wonderfully symbolic personage seized upon by Switzerland and used to the hilt, both to make money and occasionally to exonerate itself. With four hands and rolling laughter, the artist, Pierre Dutrievoz and his son, Niels, four years old, mixed their paintbrushes, words, joys and dreams to produce a splatter of colour brimming with life and happiness. Geologists and scientists have examined the rocks of the Alps for centuries to discover the secrets of mother Earth. Nature’s laboratory, to use the term by Saussure to designate the Alps, has largely contributed to our understanding of orogeny. Here the tremendous history of Alpine geology, from the beautiful stones to plate tectonics. He would have been 100 this year. A lawyer, journalist and writer, Philippe Lamour was above all the inventor of territorial planning and an advocate of quality in products, work, the environment and rural life. This summer, the village of Ceillac will celebrate the man who was its mayor for 18 years. From the Sahara to the Alps, a rather special « transhumance » took place during the French colonisation of Algeria. Entire ships of sheep crossed the Mediterranean to come graze and fatten up on the green slopes of the high pastures. Less warlike than Hannibal’s troops, the « Africans » constituted a very lucrative trade for over a century.